Most analysts assume RSHS = RSH. This is a traditional relationship and local knowledge may provide different results. The electromagnetic propagation log measures the travel time and attenuation of microwaves propagated along the borehole wall. The analysis concept is similar to a sonic log, but the frequencies involved are microwave (electromagnetic) in the gigahertz range instead of acoustic in the kilohertz range. The travel time is largely influenced by the amount of water in the formation and does not depend too greatly on other components, such as hydrocarbon or matrix rock. Because of its shallow investigation, the log measures the water volume of the flushed zones. The hydrocarbon does not contribute any signal, so the equation is solved directly for water filled porosity, assuming Vsh = 0.0. 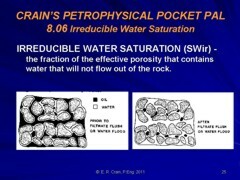 This is then compared to the total porosity, after shale volume corrections, based on data derived from the dual water method described in Section 8.11. Calculate loss free propagation time from measured propagation time. 3: IF LOGUNITS$ = "METRIC"
Calculate water filled porosity from propagation time. Calculate water saturation of invaded zone. In tar sands and heavy oil, SXOept will equal SW since there is no invasion in these reservoirs. This is also true in oil reservoirs drilled with genuine oil base mud. There may be a bit of invasion, but it does not change SW very much. Note that this value of SXOept does not depend on any knowledge of resistivity log data or assumed fluid resistivities. Shale volume can be calculated from the EPT attenuation curve in a fashion similar to the gamma ray. This helps to resolve laminated shaly sands. A graphical solution exists but is more complicated to use than these simple formulae. The value for water varies with temperature - see Step 5 for more precise values. This is a reasonable number for Sxo in a sand such as Sand D.